The Union of Workers of the Brewing Industry of Panama (Sticp) and the Industrial Union of Workers of the Manufacturing and Commercialization of Refreshments, Beverages, Soft Drinks, Beers, Spirits and Similar (Sitrafgorebgascelis) will present to AB InBev a joint proposal for a collective agreement that aims, among other things, to reduce outsourcing. The Union of Workers of the Beverage and Similar Industry (Stibys) mobilized to denounce the repeated violations of the collective bargaining agreement which was signed with Cervecería Hondureña (AB InBev) less than two years ago. Anheuser-Busch and International Brotherhood of Teamsters began national bargaining last week. Chernihiv Branch of PJSC SUN InBev Ukraine union leaders and members posed for solidarity with their coworkers at AB InBev Sonepat facility in India who have been fighting for their union and collective bargaining rights for more than two years. Following a factory visit of AB InBev-EFES joint venture in Chernihiv-Ukraine, IUF members from Turkey, Ukraine and Belgium expressed deep concern about the failure of AB InBev to remedy now long-standing human rights abuses at AB InBev Sonepat India. 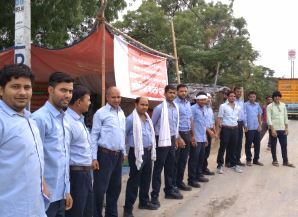 September 6 marked the 200th day of continuous protest action in front of AB InBev's Budweiser plant in Sonepat, India. Brewery workers from other AB InBev sites and Carlsberg joined the protest action in solidarity with the Haryana Breweries Limited Mazdoor Union (HBMU). IUF members at global brewery giant AB InBev's plant in Sonepat, India continue their non-stop peaceful protest in defense of union rights and recognition outside the factory gate. The Haryana Breweries Limited Mazdoor Union (HBLM) launched the action in February in response to management's escalating attacks on union members and ongoing refusal to enter into good faith negotiations for a collective bargaining agreement. 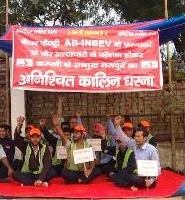 Management at global brewer AB InBev's plant in Sonepat, India is escalating its attacks on trade union rights. Since February, the union has been defending its rights with an ongoing non-stop protest at the factory gate and needs your support. CLICK HERE TO SEND A MESSAGE TO AB InBev! Asahi is to start producing its Super Dry beer brand in Europe, the brewer's president has told reporters. Super Dry will begin production at Asahi's Padua factory in the north of Italy, one of the brewing assets it acquired from SABMiller last year, Akiyoshi Koji told Bloomberg in an interview last week. The company will start selling Super Dry in Italy and the UK from January, Koji said. "I tried the beer there before production began, and the taste was the same as in Japan," Koji said in Tokyo. The US craft beer segment may have peaked, a new report suggests, as figures show stock keeping unit (SKUs) going into decline. Overall beer SKUs in the US have more than doubled in the past six years, according to figures collated by Consumer Edge Research. The increase, from 6,388 in 2011 to 13,238 at the end of last year, was driven by a rise in the number of independent brewers alongside the growing demand for craft beer. However, since the start of this year, SKUs have dropped to 12,786, a decrease of almost 4%. The 3.3%-abv Heineken 3 has captured almost a third of the Australian premium mid-strength beer market since its launch last year, Heineken has said. The beer, which is the focus of a new marketing campaign in Australia, accounted for 31% of July sales in the premium mid-strength category, according to scanner data cited by Heineken today. The brand also has a 21% awareness level with 18-65-year-old consumers and a 79% repurchase rate.